From its foundation in 1979 the Association has worked to promote the fellowship and traditions of No 101 Squadron, Royal Air Force and full membership is open to all those who have served or continue to serve with this famous and historic unit, and Associate membership to others with links to the Squadron. To keep our worldwide membership in touch and informed we publish our colourful newsletter “101 Matters!” three times a year and hold an annual reunion which is always well attended by veterans and their families, and by many other more recent members of the Squadron. An important aim of our Association is to preserve the memory of all those who gave their lives in service with 101 Sqn throughout its history. 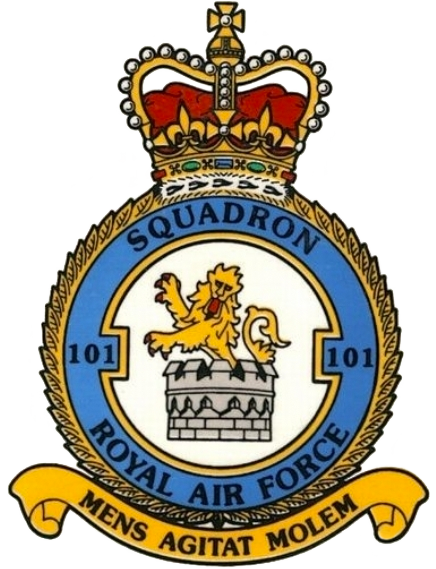 It is a sad fact that 101 Squadron has suffered the highest number of casualties of any unit in the Royal Air Force with 1200 aircrew and ground crew killed in action during WWI and WWII. Memorials to these brave men, many only teenagers, are spread throughout Europe and members of the Association attend many ceremonies to commemorate their sacrifice. Every September the Association holds its Annual Reunion in Lincoln and its annual Service of Remembrance at the church of St Peter and St Mary in the village of Ludford Magna, Lincolnshire, site of 101 Squadron’s main operating base during World War 2.